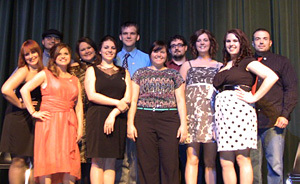 New members inducted into Delta Psi Omega for 2011. Scholarship students from PJC’s Drama Department form Delta Psi Omega (ΔΨΩ), working collaboratively as both an honors and service organization to promote theatre arts within the college and in the Paris community. Delta Psi Omega assists PJC in service and recruitment during the spring semester by hosting UIL One-Act Play contests at the Ray Karrer Theatre, which draw more than 2,000 students annually to the PJC campus. Delta Psi Omega, Alpha Psi Omega (ΑΨΩ) National Theatre Honor Society “Sister Society,” was founded in 1929 as the official junior-college division of Alpha Psi Omega. Delta Psi Omega is an American recognition honor society recognizing participants in collegiate theatre. Membership is open to those who are active in their college theatre programs. The open motto of Delta Psi Omega, written in ancient Greek upon their coat-of-arms, is “Seek a Life Useful” (αιτειτε ψύχην ωφελιμον). On record there are a total 1,019 casts, including both Alpha Psi Omega and Delta Psi Omega, making it one of the largest Greek Letter Organizations in the world.